There’s nothing we love more than creating a wedding invitation set that is unique and specific to the couple and their wedding! 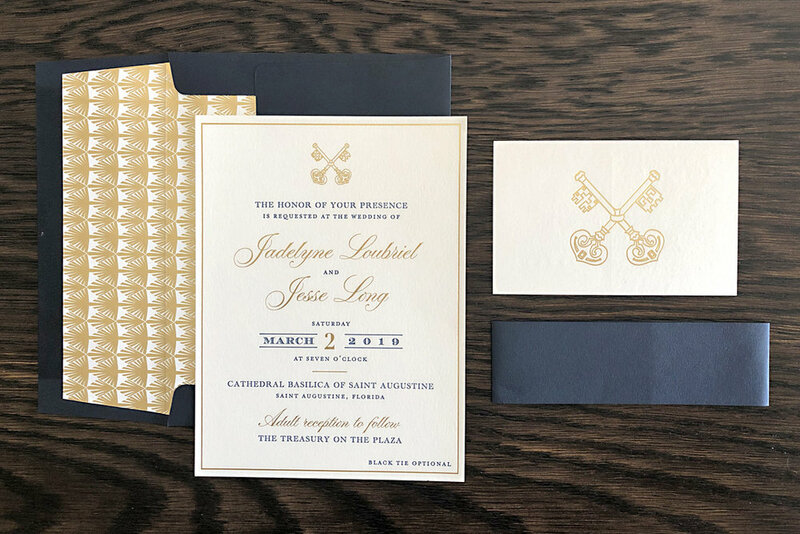 We worked with Jadelyne and Jesse to design these deco-style foil and letterpress invitations for their wedding at the Treasury on the Plaza in St. Augustine, and used the venue’s logo of two crossed keys throughout the set. I had such a blast working with Amanda and Andrew on these bright and colorful invitations for their destination wedding in Lanai, Hawaii! This set features triple-thick paper, a gorgeous watercolor monogram created by the bride, 3 colors of edge paint, and a custom die-cut fish with line to hold the set together. This tropical Art Deco-inspired invitation set for Yvette and Khosrow’s vow renewal in Palm Beach features letterpress and laser cutting - how could it get any better? The metallic navy paper pairs beautifully with gold foil, and custom gold wax seals pull the set together. Louise and Cameron's beautifully classic invitations featured black letterpress ink on ivory paper for their Oregon wedding. We continued the look throughout all of their day-of pieces, including place cards, menus, programs, hors d'oeuvres cards, and reception signage. 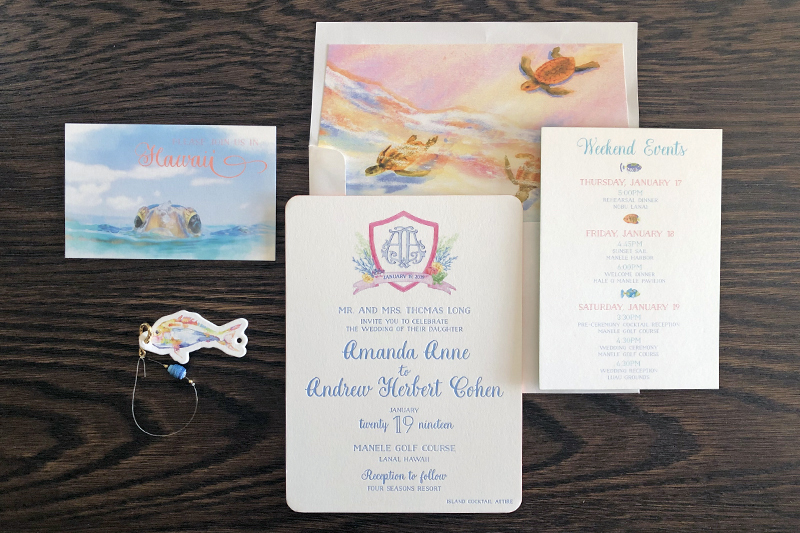 Amanda and Michael’s invitations for their New York wedding and golf club reception were the perfect blend of contemporary and elegant. We printed them in navy letterpress ink with accents of champagne gold foil, and paired them with a subtle shimmery envelope liner. Blush and gold have been the colors of the year – and this invitation set does not disappoint! Chelsea and Taylor were married at Eau Palm Beach, and based their wedding vision on the song "La Vie en Rose." We cannot get enough of how this letterpress and foil-stamped invitation set used the theme in such an elegant and tasteful way, with the envelope liner, custom wax seal, and the song lyrics on the pocketfold. Brenda Fox's designs are always among our best-sellers by Bella Figura - and if you place your letterpress order with us using one of her designs by May 31, you'll save 10% on your entire order! Whether you’re ordering save the dates, wedding invitations, birth announcements, party invitations, or personal stationery, this offer applies to it all! Plus, you can save an extra 10% when you order 6 printed pieces or more. We were so thrilled to see this wedding on Green Wedding Shoes today! We had a blast working with the couple and Haydee of Sweetest Celebrations on their custom day-of stationery.